While Allen Webster has been struggling since being sent back down to Pawtucket, Katie Morrison of WEEI.com notes that Clay Buchholz offers a silver lining for Webster. Buchholz says that Webster reminds him of himself, and that he'll find a way to fight through his struggles. In his Minor Details podcast, Alex Speier of WEEI.com talked with ESPN's Keith Law about the state of the Red Sox farm system and the potential trade chips that will be available at the deadline. Speier also talks to Henry Owens about how he handles the trade rumors. While Bryce Brentz has had some struggles this season, this piece by Jesse Smithey of the Knoxville News Sentinel helps put some of them in perspective. Bryce's twin brother, Jared, is a double amputee, and Bryce talks about how he is inspired by his brother. Brentz recently had surgery on his meniscus that will sideline him for about six weeks, but after seeing what his brother goes through every day, Brentz knows how lucky he is. Rob Bradford of WEEI.com talked with Drake Britton about the four months that forever changed his life. After being arrested for driving under the influence in spring training, Britton discusses how conversations with Sea Dogs manager Kevin Boles and pitching coach Bob Kipper, as well as Pedro Martinez, helped get him back on the right track. The four months culminated with Britton making his major league debut on July 20. Cuban pitcher Miguel Alfredo Gonzalez is a free agent, with rumors swirling that he will be signing shortly. The Red Sox are one of the teams interested in Gonzalez, and Red Sox president and CEO Larry Lucchino said on WEEI's Dennis & Callahan that the Red Sox are looking at him "pretty hard." Baseball America subscribers can read an in-depth scouting report on Gonzalez here. 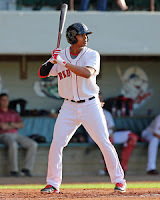 Top prospect Xander Bogaerts (pictured) had a strong week, batting .381/.500/.714 in six games. He walked four times, struck out three times, and had five extra-base hits. With Jose Iglesias struggling in the majors, Bogaerts may be in Boston soon, as his .277/.377/.500 line in 36 Triple-A games shows he does not have much left to prove in the minors. Henry Owens has been the most unhittable pitcher in the minors recently, as he followed up his six no-hit innings from last week with another five no-hit innings on Monday. The left-hander has allowed only three hits and no earned runs in his last 18 innings, walking 11 and striking out 23. Be sure to check out Futures at Fenway this Saturday, as the Sea Dogs take on the Harrisburg Senators (WAS). The game starts at noon, with Keith Couch in line to get the start. Tickets start at only $5.